To read one of my plays, email me at kirkwoodbromley [at] gmail [dot] com. 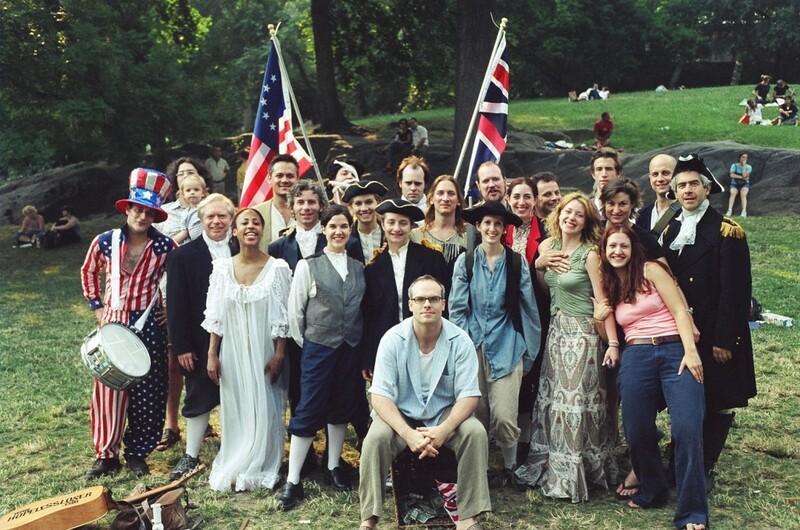 The cast and crew of Inverse Theater’s production of The American Revolution in Central Park. Executive Producer Chad Gracia front and center. I can be seen behind the Uncle Sam drummer with daughter, Fern, occluding most of my face. Kirk Wood Bromley wrote 25 original verse plays between 1990 and 2012. He may be the only living American playwright whose entire body of work is dedicated to theatrical verse. While he has been compared to Shakespeare (New York Magazine, Time Out NY, LA Weekly, OffOffOff.com, and the Cleveland Scene) and Stoppard (The Village Voice), his writing “speaks directly to its audience’s concerns and in its dialect” (American Theater Magazine, 1996). After moving to NYC in 1990, Bromley wrote, workshopped and produced his plays either on his own or in collaboration with Aaron Beall of Nada, a theater on NYC’s Lower East Side, until 1999, when Nada closed. He then co-founded Inverse Theater with dramaturg/producer Chad Gracia, and until 2012 all his plays were workshopped and produced by Inverse Theater. In May 2012, Inverse Theater stopped producing plays and is now dedicated to facilitating productions of Bromley’s works around the world. Bromley has created plays in various genres. Upon his arrival in NYC he began writing the works that garnered comparisons to Shakespeare – All Must Be Admitted, The Death of Don Flagrante Delicto, The Burnt Woman of Harvard, Want’s Unwisht Work, Icarus and Aria, Lost Labor’s Loved, The Death of Griffin Hunter, The American Revolution, Midnight Brainwash Revival, and On the Origin of Darwin. Near the end of this phase, in 2002, he began creating shorter, small cast and solo plays (Syndrome, Remission, Three Dollar Bill, No More Pretending) as well as musicals (Lost, The Bangers’ Flopera), the latter in collaboration with composers Jessica Grace Wing (1971 – 2003) and John Gideon respectively. Since 2007 he has generated more experimental works (Me, Un(en)titled, When I Met Juliet, Cycatrix Adaptitude, Be Story Free, Dazl). In NYC, his plays have been produced by Todo Con Nada and Inverse Theater at The Village Vanguard, The Ohio Theater, Soho Rep, PS 122, Clemente Soto Velez, The Connelly, Theater Row Theaters, Nada, The Kraine, The Greenwich Street Playhouse, Access Theater, House of Candles, Nuyorican Poets Cafe, The Brick, Circle Rep, The Home Of, Central Park, Prospect Park, East River Park, and more. Outside NYC his plays have been produced by FoolsFury (SF), Sacred Fools (LA), Bad Epitaph (Cleveland), Arizona OnStage (Tucson), Los Angeles Community College, Wesleyan University, and Kenyon College. Over the course of these many productions, Bromley has worked with a wide array of highly talented and at times duly awarded theatrical practitioners, including Patrick Gaspard (actor, Executive Director of the Democratic National Committee…yes, he was in Bromley’s first play, All Must Be Admitted, in 1991), Robert Lopez (Tony Award-winning composer, Avenue Q and Book of Mormon), Mark Hollmann (Tony Award-winning composer, Urinetown), Josh Fox (actor, Director of Gasland), Matthew Maher (actor, Obie Winner, John From Cincinatti, Gone Baby Gone by Ben Affleck, Berkeley Rep’s Pillowman), Steven Rattazzi (actor, Obie Winner, The Venture Bros., The Public’s Henry V with Liev Schreiber), T. Ryder Smith (actor, War Horse [Tony Award for Best Play 2011], Equus with Daniel Radcliffe), Matt Oberg (actor, 30 Rock, Ugly Americans), Beth Griffith (singer, John Cage), Peter Schmitz (dancer, Yanira Castro), Steve Burns (actor, Blue’s Clues), Chris Briggs (actor, Robert Rodriguez films), Luke Murphy (dancer, Sleep No More), Alec Duffy (director, Three Pianos, NYTW), Brenda Withers (actor, Matt and Ben), Joseph Pindelski (actor/dramaturg, A.R.T. ), Megan McCary (actor, Clubbed Thumb), Alok Tawari (actor, Bengal Tiger at the Baghdad Zoo), Russell G. Jones (actor, Ruined [LAByrinth Theater’s Pulitzer Prize and Obie Award Winner], Our Lady of 121st Street), Julie Lund (actor, Neil Simon’s 45 Seconds from Broadway on Broadway), J. Reid Farrington (designer, Wooster Group), Morgan von Prell Pecelli (designer, Former Development Director for PS 122), Jessica Chandlee Smith (actor, Mabou Mines’ Peter and Wendy), Chris Barron (lead singer, The Spin Doctors), Louisa Thompson (designer, Soho Rep’s [sic] and Molly’s Dream), Mark Barton (designer, Young Jean Lee’s The Shipment, ERS’s The Sound and The Fury, Edward Bond’s Chair), Robyn Hussa (actor, Transport Group), Sven Holmberg (actor, King of Queens), Kate Hampton (actor, Pride and Prejudice Off-Broadway), PJ Sosko (actor, The Good Wife), Rizwan Manji (actor, Outsourced, The Dictator), Emma Griffin (director, Williamstown Theater Festival), Ben Yalom (director, Fools Fury), Alexander Yannis Stefano (director, Sacred Fools), Howard Thoresen (director, Portland Shakespeare Festival), and many, many more. Bromley or his productions have won numerous awards, including Best Downtown Theater Company (NY Press 2001), The Berrilla Kerr Foundation Playwriting Award (2001), Best Music/Lyrics (NY Int’l Fringe Festival 2002), Excellence in Playwriting (NY Int’l Fringe Festival 2003), the first ever Caffe Cino Award (NY Innovative Theater Awards 2005), “Top Three Musicals” (American Theater Web 2005), Outstanding New Musical (Talkin’ Broadway 2005) and Outstanding Solo Show (NY Int’l Fringe Festival 2009). Bromley has taught or given seminars on playwriting at Stanford University, SUNY-Purchase, The National Book Foundation Summer Writer’s Camp at Bard College at Simon’s Rock, Monroe College (Bronx, NY), and Trinity School (NYC). His writings on theater have been featured at theatermania.com, nytheater.com, and Backstage. Midnight Brainwash Revival was anthologized in “Plays and Playwrights for the New Millennium,” published by the NY Theater Experience, and as of August 2012, all his works will appear at indietheaternow.com. For an overview of Bromley’s writing and career by one who knows him very well, go here.